Atopic dermatitis (AD) patients are more frequently colonized with Staphylococcus aureus. The aim of this study is to determine the prevalence of community-acquired methicillin-resistant S. aureus (CA-MRSA) colonization in AD patients in a dermatology clinic in Mansoura, Egypt, and to assess the resistance pattern and the superantigen genes among isolated strains. Sixty AD patients were evaluated for the carriage of CA-MRSA in both lesional skin and nose. 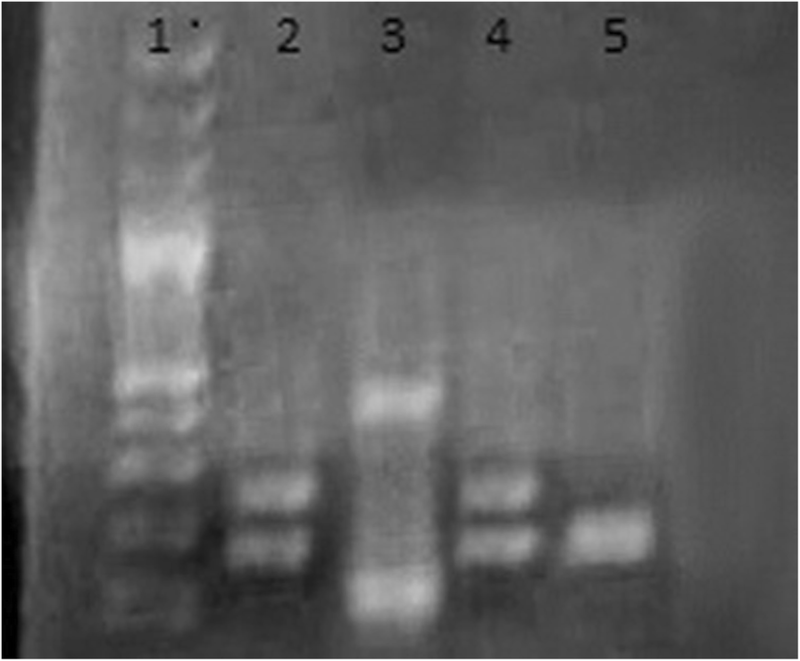 Antimicrobial susceptibility tests were performed using the disc diffusion method. The detection of mecA gene and superantigen genes, toxic shock syndrome toxin (tsst), and staphylococcal enterotoxin sea-sed were done by PCR. Twenty-eight patients (46.7%) were colonized with CA-MRSA. All isolates were sensitive to vancomycin. 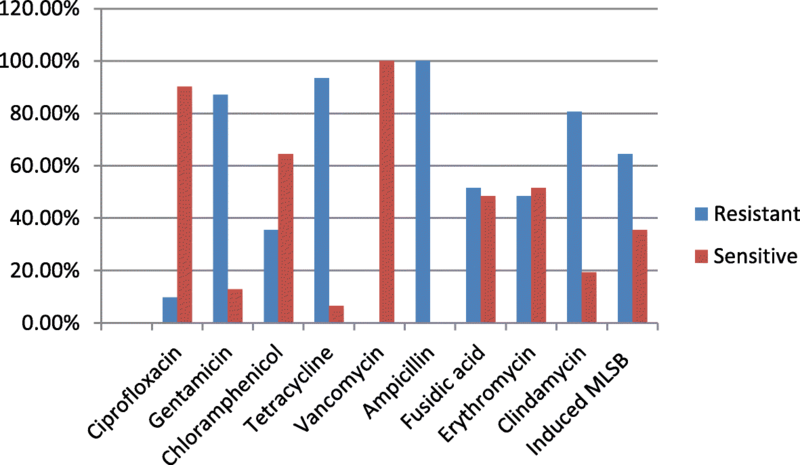 Only 9.7% of isolates were resistant to ciprofloxacin, while 52.6% of isolates were resistant to fusidic acid and 48.4% were resistant to erythromycin. The predominant toxin gene found in AD patients was tsst that found in 100% of isolates of CA-MRSA, while seb and sed genes found only in 61.2% of the isolates. Atopic dermatitis patients were colonized with CA-MRSA. The most common toxin gene in the Egyptian AD patients was tsst. There is no significant association between any of superantigen genes and severity of AD. Atopic dermatitis (AD) is a widespread chronic inflammatory skin disease, affecting 10 to 20% of children and 1 to 3% of adults (Sun and Ong 2017). The pathogenesis of AD is multifactorial, and it involves an association between certain genes, immunological factors, skin barrier defects, skin infection, and environmental factors (Boothe et al. 2017). The skin of AD patients is liable to infection by bacteria, fungi, and viruses that may be explained by impaired skin barrier functions and innate immune defects (Park et al. 2013). Staphylococcus aureus colonization is common in AD patients (Ochmann et al. 2013). Recently, the incidence of community-acquired methicillin-resistant S. aureus (CA-MRSA) has increased among general population (David and Daum 2010). The objectives of the present study were to determine the prevalence CA-MRSA colonization in AD patients in a dermatology clinic in Mansoura, Egypt, resistance pattern and superantigen genes among isolates of CA-MRSA. A cross-sectional study was carried out on 60 patients diagnosed as AD randomly selected from AD patients attending the dermatology outpatient clinic, Mansoura University Hospital (M.U.H. ), Egypt, over a 1-year period (from May 2016 to April 2017). The Institutional Research Board (IRB) of the Faculty of Medicine, Mansoura University, approved this study, and each participant provided an informed consent before entering the study. All participants were subjected to careful history taking, full general and dermatological examination, and evaluation of clinical severity of AD. The clinical severity of AD was assessed by SCORing Atopic Dermatitis (SCORAD) scoring system fulfilling the criteria of AD (European Task Force on Atopic Dermatitis, 1993). Household facilities in management of hygiene and care of the skin were assessed during history taking from patients. Any AD patient of any age was randomly selected and enrolled in the study. Patients with other chronic dermatological condition associated with defects in skin barrier (e.g., psoriasis, ichthyosis, and seborrheic dermatitis); if patients had any other conditions increase the risk of healthcare-associated MRSA colonization, history of recent surgery, and dialysis; and if the patients had an indwelling catheters or a medical devices inserted through the skin at the time of enrollment or history of hospitalization within the previous year. Nasal and skin swabs from lesions were obtained from AD patients by sterile cotton-tipped swabs. Samples were cultured on mannitol salt agar and 5% sheep blood agar and incubated aerobically at 37°°C for 24 h. Colonies are identified as S. aureus by colony morphology, Gram stain, catalase, coagulase, and DNAse tests. The sensitivity of MRSA isolates was examined by disk diffusion method according to the guidelines of CLSI, against antibiotics including ampicillin (10 μg), gentamycin (10 μg), erythromycin (15 μg), chloramphenicol (30 μg), imipenem (10 μg), ciprofloxacin (5 μg), tetracycline (30 μg), vancomycin (30 μg) and fusidic acid (10 μg), and cefoxitin (30 μg). An isolate was reported as MRSA if the cefoxitin inhibition zone diameter was ≤ 21 mm. Inducible clindamycin resistance was detected by D test (Clinical and Laboratory Standards Institute, 2016). Genomic DNA was extracted by the GeneJET Genomic DNA Purification Kit (Thermo Scientific). All S. aureus isolates resistant to cefoxitin were examined by PCR for the presence of mecA gene, staphylococcal enterotoxin genes (sea, seb, sec, sed), and toxic shock syndrome-like toxin gene (tsst)-1. 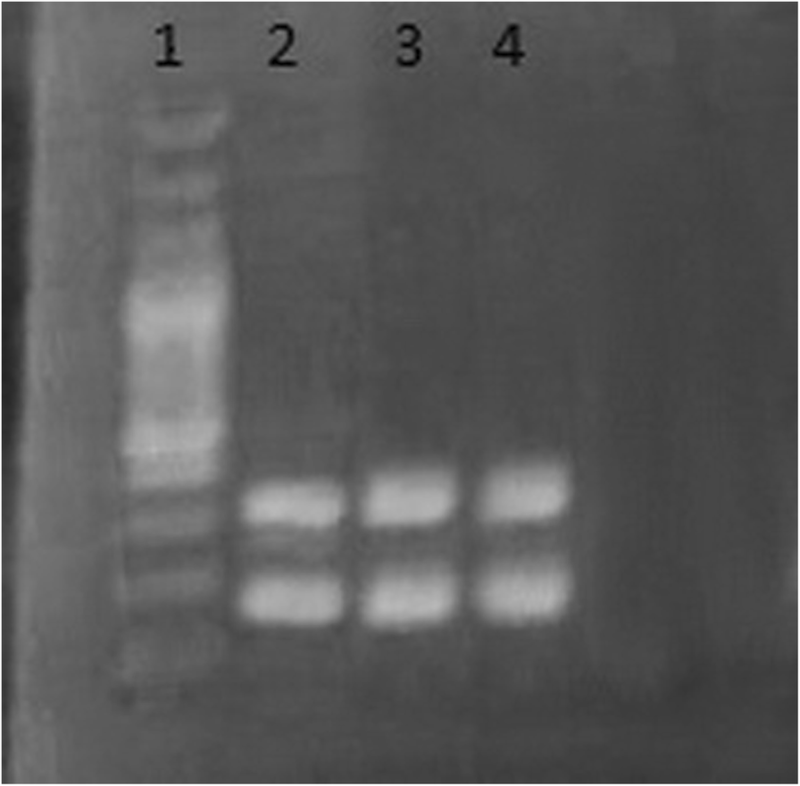 Two sets of multiplex PCR were separately performed using (1) mecA and tsst-1 primers and (2) sea, seb, sec, and sed. PCR was conducted in a Perkin-Elmer GeneAmp 2400 thermal cycler with an initial denaturation at 94 °C for 5 min followed by 35 cycles of amplification (denaturation at 94 °C for 2 min, annealing at 57 °C for 2 min, and extension at 72 °C for 1 min), ending with a final extension at 72 °C for 7 min (Mehrotra et al. 2000). PCR products were analyzed by electrophoresis in a 2% agarose gel that was stained with ethidium bromide. Primers used in this study and the product sizes of analyzed genes are listed in Table 1. During the study period, a total of 120 samples (60 from lesional skin and 60 from the nose of patients) were collected from 60 patients: 34 women (56.7%) and 26 men (43.3%). The median age was 4.5 years (range from 1 to 70 years). The duration of AD is 12 months (range from 1 to 156 months). Household facilities in management of hygiene and care of the skin were of average good quality in all patients. S. aureus was reported in 54 (90%) out of 60 AD patients. Twenty-nine patients (48.3%) were colonized in both lesional skin and nose. Thirty-six out of 60 skin swabs (60%) and 47 out of 60 nasal swabs (78.3%) were positive for S. aureus. CA-MRSA was identified by resistance to cefoxitin by disc diffusion test. All the tested MRSA isolates possessed the mecA gene. Thirty-one isolates of CA-MRSA were identified in 28 (46.7%) patients. Thirteen (21.7%) out of the 60 skin swabs and 18 (30%) out of the 60 nasal swabs were positive for CA-MRSA. The characters of AD patients colonized with MSSA and CA-MRSA were discussed in (Table 2). Antibiotic resistance pattern of CA-MRSA isolates was shown in Fig. 1. All isolates of CA-MRSA carried superantigen genes (27 strains carried multiple genes and 4 carried a single gene). Thirty-one isolates carried tsst gene, 24 isolates carried sec, 21 isolates carried sea, and 19 isolates carried seb and sed Figs. 2 and 3. There is no significant association between any of the tested genes and the severity of the disease (Table 3). The lesion of atopic dermatitis is more susceptible to colonization and infection by microbes, such as S. aureus (Sun and Ong 2017). In the current study, CA-MRSA was detected in 28 out of 54 patients colonized with S. aureus, while Hwang et al. (2017) in Korea found that 39.4% of AD were colonized by MRSA. A lower percentage of MRSA among S. aureus isolates ranged from 0 to 16% in other reports (Petry et al. 2014; Balma-Mena et al. 2011; Suh et al. 2008). This difference in the prevalence of S. aureus in AD patients might be due to variable methods of sampling, intermittent colonization, and the hygienic status of patients. Moreover, David and Cambridge (1986) declared that one of the main reasons for the differences between studies is the great difference in the clinical severity of the AD in each study. This could interpret the high rate of colonization in our study as more than half of our cases were severe AD. Patient with AD has increased risk of increasing antibiotic resistance due to the frequent use of topical and systemic antibiotics (Lipnharski et al. 2013). In this study, a high rate of antibiotic resistance was reported. About 80% of isolates were resistant to clindamycin. Moreover, about 64.5% of isolates exhibited the iMLSB. The rate of erythromycin-induced resistance to clindamycin is high as that reported by Gomes et al. (2011). The increasing resistance to macrolides may limit the use of erythromycin (Chaptini et al. 2016). In our study, a high rate of resistance was noted for fusidic acid (51.6%). Similarly, the rate of fusidic acid resistance is 50% in dermatological patients (Shah and Mohanraj 2003). On other hand, previous publications have reported a lower rate of resistance to fusidic acid (Hwang et al. 2017; Błażewicz et al. 2018). The use of fusidic acid for a short period is recommended in the treatment of skin infections in order to preclude further resistance development (Błażewicz et al. 2018). The responsibility of staphylococcal virulence factors in the pathophysiology of AD is an active area of study (Jochmann et al. 2013). In this study, all CA-MRSA isolates from AD patients were positive for at least one of the tested toxin genes. Similarly, two studies found that toxigenic genes among MRSA and S. aureus in AD were 90% and 100%, respectively (Lo et al. 2010; Silva et al. 2006). On the other hand, two reports from Egypt found that only 50% and 54% S. aureus strains were toxigenic (Gerges et al. 2015; Nada et al. 2012). In the current study, the tsst was the most commonly detected gene in CA-MRSA isolates. In addition, there was no correlation between certain superantigen gene and the severity of AD. tsst gene was the most common detected superantigen (Schlievert et al. 2008; Kim et al. 2009). However, other superantigens were found in other reports (Lo et al. 2010; Błażewicz et al. 2018). Preceding reports also found no relation between superantigen and severity AD disease (Kozman et al. 2010; Rojo et al. 2013). On the other hand, Pascolini et al. (2011) found that tsst-1 were significantly more frequent in children with severe AD. In addition, Breuer et al. (2002) showed that seb may worsen skin lesions. The variation in predominant toxins in the studies may be due to its difference in geographic areas, difference in the number of superantigens tested, or difference in the methods of detection (Kim et al. 2009; Na et al. 2012). Atopic dermatitis patients were colonized with CA-MRSA. The most common toxin gene was tsst in the Egyptian AD patients. There is no significant association between any of superantigen and severity of AD. To the soul of Professor Ramdan A. Mahfouz, we’d like to express thanks for his guidance in selecting, determining the structure and supervising the research work. RE designed the study and analyzed and interpreted the data. MG diagnosed the cases, reviewed the study, and edited the manuscript. RE and HA carried out the microbiological tests and contributed in writing the manuscript. All authors read and approved the final manuscript. The protocol was approved by the institutional research board at faculty of medicine, Mansoura University. Informed consent to participate was taken from all participants.